After this story was published yesterday, Robert, you attended a council meeting of committee presidents. Ken Johnson spoke and explained that the gas bill you ripped him for was for removing snow from senior and disabled sidewalks and driveways; and for inspecting the 600 vacant properties in his ward for open doors and loose boards. He mentioned "Alliana DeFreeze" as the basis for the vacant property inspections and you approached him afterwards. You have more information that contradicts the false premise behind Mark Naymik's stories and yours but you've not shared it. Nothing more underscores the points I've made here and other forums about the trustworthiness of news coming from writers like you, Naymik and others. It's not what you share. It's what you don't. You have now intentionally left your readers with the wrong impression even though you have more facts they can use to compare what you shared yesterday to what you also learned yesterday. I know you attended law school and don't practice. I know your license is inactive. But the ethics of the profession you don't practice respects justice and fairness even if individual lawyers don't. If you were a prosecuting attorney who has just discovered the man he's trying to prosecute is innocent, Disciplinary Rule 3.8(d) instructs prosecutors they shall not "fail to make timely disclosure to the defense of all evidence or information known to the prosecutor that tends to negate the guilt of the accused or mitigates the offense, and, in connection with sentencing, fail to disclose to the defense all unprivileged mitigating information known to the prosecutor, except when the prosecutor is relieved of this responsibility by an order of the tribunal." Your story observes that members of council are using funds appropriated for expenses to pay extra wages to their aides. State law, again, gives council the power and duty to set wages "by ordinance." Once a wage is set in an ordinance it can't be increased with money appropriated for expenses. Your headline should have read, "Kelley leads misappropriation of council funds." You have to read laws before you write. Here are the legal powers of a member of council as identified in the Revised Code of Ohio. Does any of what's written require cars, ward lunches, ward offices, etc? The law below has been on the books since October 1, 1953. If you knew the legal duties of a member of council you might realize you've been writing about the wrong stuff. For what it's worth I already have the expense reports of the council members and have drawn my own conclusions about the information you left out of Zone's reports and others; or didn't understand. You've picked through the reports as if your evaluation of the expenses is a legal analysis based on a comparison of local, state and federal spending laws neither of you have ever cited or shown you understand. Consider, Robert, that the duties of council members are "legislative only." So a lunch or ward meeting should connect to a legislative act. You cite lunches but you don't seek to know the individual names of the lunch attendees. You cite travel but for what legislative purpose? To be used in support of a public duty the expense money must be appropriated in connection with pending legislation, repealing legislation or amending legislation. Research for a council "investigation" like those conducted by Congress. Investigating is a legislative duty found in R.C. 733 and a supported expense. Ward meetings are not legislative acts if the meeting isn't connected to a discussion with residents about pending, repealed or amended legislation. Even your headline misleads. $1200 a month for Johnson. Then you write that Kelley's spending "typically exceeded $1100" a month without saying he was within cents of Johnson's $1200 to keep him from looking as bad as Johnson. I've got the reports. I know what you left out. Reply to @Robert Higgs, cleveland.com: As I shared in other comments, Robert, council passes a salary ordinance. It's a requirement of law that it be done annually. Wages are set by ordinance. Any dollars appropriated for "expenses" and then added to an employee's line item for "wages," would also increase the city's pension contribution to the employee. What you've described, Robert, is "theft" and a reportable offense to the Auditor of State and the Ohio Public Employee Retirement System. Submitted by lmcshane on Mon, 04/15/2019 - 10:32. Chester Cuiksa gets preferential treatment by Tony Brancatelli in Ward 12 - this slum landlord runs his rental properties under CTC Properties DOESN'T Pay TAXES or the water bills and takes a cut on properties sold by Slavic Village Recovery as Northcoast Homes...Joe Pagonakis pls ask Ron O'Leary why this guy is not on the dockets? http://realneo.us/…/5707-hege-44105-slavic-village-recovery… Eric Jonathan Brewer Sam Allard different standards for different council persons?...What are they doing with the additional monies they were allocated in the approved city budget?? I haven't met you in person - but you know that there is perception that Scene magazine has participated in a hit job on Kenneth Johnson, while ignoring similar behavior on the part of "white" council members. Eric J Brewer is cc.d. In an effort to provide equal coverage, I am asking that you post the following commentary on Brancatelli. --How his wife, Gail Glamm, was recipient of public monies through Hatha Communication contracts with the Cuyahoga County Land Bank, which Brancatellli currently chairs. See the attached correspondence from Douglas Sawyer at the CCLB. I do ask that your publication requests or sues Slavic Village Development Corporation for these email transactions. As a private citizen, I am limited in my public record requests and this may require a lawsuit to release these transactions. 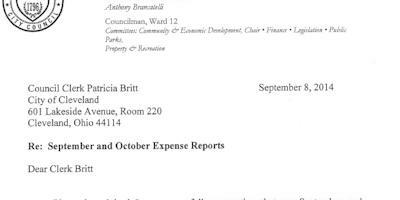 I did request expense reports for Brancatelli from the City of Cleveland - and in many cases, where he makes donations (FROM his city expense account) to block clubs and non-profits like Canalway Partners - see below - he uses his slavicvillage email address. NOTE: Canalway director Tim Donovan also serves on the Board of Zoning Appeals. --There is also the large demolition contract to Baumann Construction Brancatelli approved as CLE Council rep Ward 12 -and approved by Brancatelli as Cuyahoga County Land Bank president. Brancatelli also approved the transfer by the CCLB to CHN of a commercial and industrial property cleared by taxpayers - over $118K wited out and well over $400K in demolition and asbestos removal costs for 3873-3881 W 25. Including the suspicious acquisition of 3873 W 25 by CCLB for $250K only to have it demolished for CHN-Eden Emerald Alliance project. I have also shared this information with the Ohio Ethics Commission and the Ohio Housing Finance Agency. Thanks to a lawsuit filed by WEWS Channel 5 and investigative reporter Sarah Buduson, the city of Cleveland was compelled by the Ohio Court of Claims to release the full, unredacted bid for Amazon’s second headquarters late Friday. Flavor our songs and spice our fiction. Give their ignorance all renown. Submitted by lmcshane on Thu, 04/18/2019 - 09:40. Chester Cuiska and wife, Mary - rent out tax delinquent properties that are now on the docket to be inspected. FTR -THERE are rental units managed by slum lords like the Cuiskas - throughout the city. What does it take to close this loophole?? Why has Cleveland City Counil not acted on this problem?